National Machinery Exchange has been a leader in fabrication equipment since its outset in 1934. We service all assets of the a plant or job shops fabrication needs from mechanical and hydraulic shears or press brakes, Tank equipment, flangers, ironworkers, circle shears, flame cutters, plasma cutters, lasers, hydraulic and mechanical bending rolls, angle bending rolls, welders, welding manipulators, drills, structural beam lines, beam coping lines, beam cambering machines, angle lines, and more. 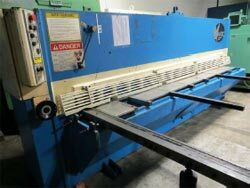 Contact us with all your fabrication equipment needs.